Nine Bright Now!® Dental locations across the Mid Atlantic area are joining forces with local food banks to collect food items to be distributed to people in need across their communities. The Share a Smile Food Drive is already underway! In an effort to encourage even more people to participate in the food drive, Bright Now Dental will be offering anyone who donates five or more non-perishable food items, a choice of one of two different discount opportunities. 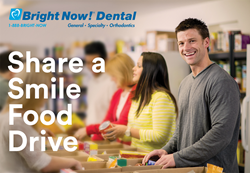 To make a person smile this season and earn valuable discounts on dental treatments, bring five or more non-perishable food items to the nine Bright Now Dental locations. Bright Now! Dental offers convenient, full service dental care to adults and children, including: general dentistry and specialty care services such as orthodontics, oral surgery, periodontics and endodontics. Bright Now! Dental has over 150 locations across 12 states.